If someone else spent weeks on end portraying a historical role, actual or fictional, you'd likely guess they were an actor by profession. If someone combined these passions and fueled them with a boundless energy, a willingness to accept self-inflicted physical discomfort, a desire to learn obscure or even dangerous hobbies, and a penchant for equal parts highbrow and low-brow humor, well -- you've got yourself a renaissance faire performer. 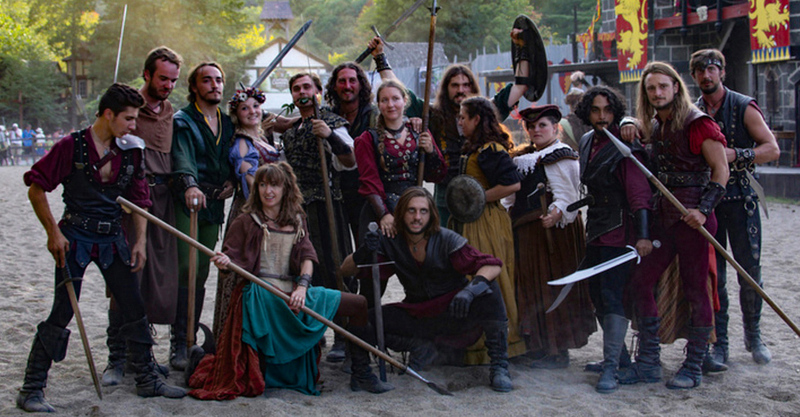 The origins of renaissance faires and festivals can trace back to the late 1950s, but it wasn't until the mid 1960s and early 70s that the idea of a weekend-long historical immersion enterprises began to appear in the United States. These interactive attractions combined music, dance, and theatrical performance with demonstrations of archery, riding, combat, artistry, crafting, and even smithing. Faire-goers came to expect an experience where the staff (or cast, or company, the labels may vary) remains "in character" at all times, adding to the sense of realism. These are commercial endeavors, to be accurate, but something about the nature of comradery and desire to create a complex and intricate illusion for the patron makes "faire-folk" a very special breed. We'd like to find out what makes renaissance faires as popular now as they've ever been in a 40-plus year legacy, and in addition to the constant stream of patrons, what draws talent in from long distances to be a part of this most unique production. To help make that happen, we sat down for a raucous conversation with Kelly and Don Kilcoyne, two of the principal writers, directors, choreographers, marketers, oh -- and cast members -- of the 40-year running New York Renaissance Faire in Tuxedo, New York.